Pub and live music venue in Camden Town. It's dimly lit inside, with a low ceiling, bare boards on the floor, and old gig posters on the walls. Much of it is painted black, adding to the gloom. A pool table sits to one side just by the entrance. 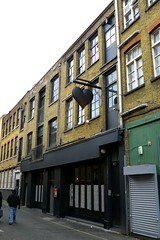 The live music venue is upstairs, accessed via stairs through a door at the back. The bar is dominated by keg taps, and the ceiling beams and pillars around the bar are covered in old beer badges, indicating a rotation of offerings. Kake visited on a Tuesday afternoon in September 2015. There were four other people in when I arrived around 3:30pm. Rock music was playing at pretty much the ideal level, loud enough to be heard but not loud enough to impede conversation (apparently they turn it up in the evenings though). Service was helpful and knowledgeable — the staff member on duty offered help choosing as well as a taster, and we had a small conversation about favourite hops. They do food, though we're not sure what times. Accessibility: A step to get in, and two more steps to the bar, seating, and toilets. No further steps to the (unisex) toilets once you're in, but the cubicles are a bit of a squeeze. Last visited by Kake, September 2015. Opening hours taken from the Black Heart website, August 2015. Last edited 2016-09-18 15:25:42 (version 4; diff). List all versions. Page last edited 2016-09-18 15:25:42 (version 4).